Saying that Nissan will have a pioneering race car showcasing electric technology, CEO Carlos Ghosn promises a return to the 24 Hours of Le Mans in 2014. Nissan's CEO Carlos Ghosn promised on Monday that Nissan will return to the 24 Hours of Le Mans with "a pioneering Nissan race car showcasing electric technology." The promise came as part of opening the new NISMO headquarters in Yokohama, Japan (for more on that see Nissan launches NISMO as a global performance line looking to lure gamers) but the press release left many details unanswered. The announcement says the new car will be developed by NISMO, Nissan's global motorsport and performance arm. It will use "a new approach to innovation and excitement" and be an "all-new race car incorporating electric technology." In part Nissan's entry will allow testing of "innovative new powertrain technology" as well as providing officials with the Automobile Club de l'Ouest (ACO) and the Federation Internationale de l'Automobile (FIA) "with data to enable all parties to evaluate the incorporation of this breakthrough technology." All these words sound nice but they are imprecise on a two points: Will it be an all electric race car? And if so, how would they credibly race an electric car in a 24 hours endurance race? The announcement says "electric vehicle technology" without saying precisely whether there will be a gasoline engine on-board. But, if this were to be a hybrid race car then Nissan would have said so, right? Toyota has entered a hybrid race car, the TS030, in the FIA World Endurance Cup, the series which includes the 24 Hours of Le Mans, and clearly describes that car as a Hybrid. The TS030 uses Supercapacitors to capture regenerative braking energy, and unleash that energy for speed bursts around corners. Several organizations have built electric race cars that could compete on speed alone. But there's this issue about the driving range, or in this case racing range. How would an electric race car finish a 24 hours endurance race? And how could pit stop time be kept to a minimum? The last is unrealistic, however that is the approach being followed by the Formula E series. Each team in that series will have four cars to race sequentially through a race. The first has been done several times in race conditions. For example, Zero Motorcycles staged the 24 Hours of Electricross event in 2009, a 24 hour endurance race with electric dirt bikes. The event relied on the quickly exchanged battery pack of some of Zero's motorcycles. Each team had one bike and three battery packs, one pack on the bike the other two in the pit recharging. During each pit stop both the pack and the rider would be changed out for fresh ones. The exchange took approximately 1-2 minutes. Changing out the battery pack is similar in essence to refilling the gasoline tank with fuel. The key point is whether Nissan can build a battery pack with enough energy to carry the vehicle through a significant enough length of time to give the team a chance to place well. The more often the car has to return to the pit, the les time it will have on-track to keep up with the race. The third strategy, Quick Charging, is unlikely to be used in a race. Pit stops need to be fast so that the car can get back on the track quickly, and quick charging is not at this stage up to that task. Nissan will be occupying Garage 56 at the 2014 Le Mans. That garage is reserved for innovative concept cars. 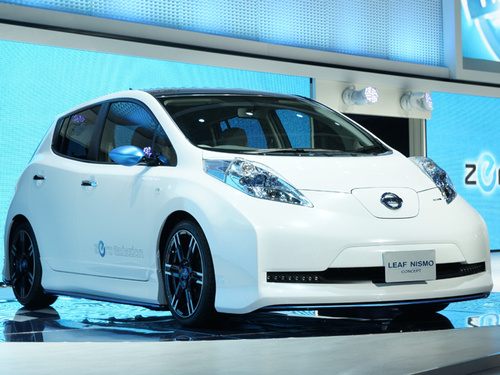 Nissan occupied that garage in 2012 with the Delta Wing, and in 2013 that garage will be occupied by the GreenGT hydrogen fuel cell race car. A report on autosport.com is written as if this will certainly be an all electric race car. That report quotes Darren Cox, who was the architect of the company's involvement in the DeltaWing project, as saying "We have said all the way through this journey that we have to have the maximum relevance to our road car technology and Nissan is the leader in electric vehicle technology, so we should be doing something in that line on the racetrack."